Best of the Week: Naim Uniti Atom, Apple ITunes 4K movies, Honor 9 smartphone and more | What Hi-Fi? This week there was speculation Apple could be preparing 4K films for iTunes, Spotify is getting ready to take on Apple in the podcast space and Forrest Gump is getting a chocolate-coloured vinyl release. Elsewhere we have an exclusive review of Naim's Uniti Atom amp/music streamer, plus reviews of Bose's SoundLink Revolve wireless speaker and Honor's 9 smartphone. This week marks the release of the September edition of What Hi-Fi?. 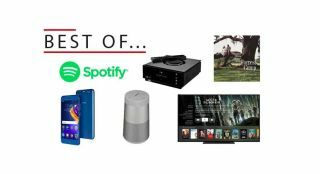 In it you'll find group test on hi-fi speakers around £300, Dolby Atmos soundbars, 4K Blu-ray players and your usual bevy of hi-fi and home cinema news. You can subscribe/buy the magazine, or buy the digital edition on iOS, Android and Kindle devices. MORE: Save over 50% on What Hi-Fi? plus a free five-star wireless speaker! MORE: September 2017 issue on sale now! It looks like we could be getting 4K HDR films through iTunes. While Apple hasn't confirmed anything, users have spotted some films being registered as 4K HDR, although the film can only be downloaded in HD. It certainly syncs with other rumours that speculate that Apple is prepping a 4K Apple TV box. MORE: Apple reveals "4K HDR" films on iTunes – 4K Apple TV incoming? Spotify is looking to challenge Apple's grip on the world of podcasts. A number of podcast hosts are ready to plug Spotify during their shows, with Spotify looking to fund a new batch of original podcasts in the near future as it looks to take Apple on its own turf. More twenty years after it came out, Alan Silvestri's Forrest Gump is getting a vinyl release. But this release is not like any other. This vinyl will be chocolate-coloured, echoing the film's famous phrase that "life is like a box of chocolates". There's only 1500 copies being pressed in the chocolate colour and it'll be out this September. "The most immediately noticeable upgrade from the UnitiQute 2 is the level of clarity and insight"
If you fail to be excited by Naim's Uniti Atom then there's little hope for you. It's rare you get a product that looks and sounds as good as the Atom. With class-leading clarity, precise timing and impressive dynamic range, it's an upgrade on the UnitiQute 2. We can't find anything of note to moan about. This streamer has plenty of substance to go with the style. "It’s hard not to admire the Bose Revolve for its ingenuity and range of talents, though"
Bose's Revolve is a small speaker but it delivers a huge performance. It produces a big, solid, punchy sound, so you'll hear it no matter what. However that comes at the expense of detail and articulation. If you don't mind that, or the £200 price, then the Revolve is a steady option. "This is as much phone as you’ll get for your £400 right now"
The Honor 9 includes features you'd expect from a more expensive phone. Performance is responsive, the design pleasing and the feature set is excellent. It has its share of problems with an average battery and Android customisations that are fiddly to use at the top of the list. It's a good phone rather than a great one, fine for those on a budget.